While punching on a bag and I’m choking. Mind, but I hide behind a simpleminded notion. Feeling like a fool, that was chosen. Bombed, really need to get that good vibe going. I put my nerves in the coffin. I’m gonna grab the moment. Try to stand straight, but I’m boneless. Toes, and I’m coping with a map that is roadless. Quiet in a corner seeking action. I need to stop drowning in distractions. Better get that good vibe buzzing. I get that good vibe buzzing. There’s a calling for that leap. Got no con--trol, but I know, there’s a fire in my soul. Hidden deep, in that beat, there’s a calling for that leap. 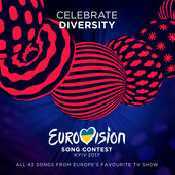 - Álbum "Eurovision 2017 - Norway" del año (2017)	.